The five different punches available in Jab: Realtime Boxing. Overview: In the movie Real Steel , human boxing is replaced by giant robots which can pound on each other without actually risking serious injury to humans — it keeps the split-second calculations, mind games, and fist-pounding strategy while keeping the players safe. Well, for those of us without massive machines to put into the ring, here’s the next best thing. 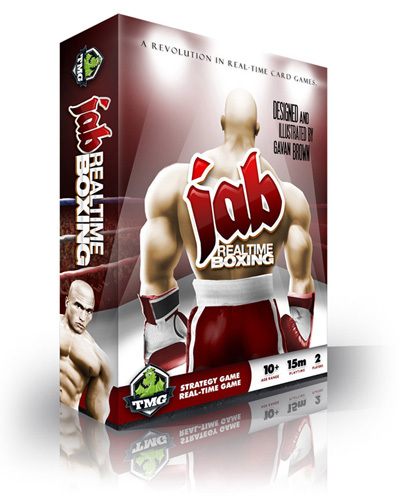 Jab: Realtime Boxing is a card game that lets you whale on your opponent without too much actual physical contact. Rating: It’s a knockout! While I do have a few gripes about the game, overall it’s a lot of fun and I can see myself getting it out whenever I’ve need a quick, exciting, two-player game. Who Will Like It? Definitely for fans of fast and furious games. There’s some strategy involved, but if you’re too slow on the take it doesn’t matter how well you can plan. It probably also helps if you (and your fellow gamers) appreciate a bit of trash talking. Even if you’re not a fan of real-life boxing (I’m not), you may still enjoy this game. It’s all about boxing. You play with both hands, and there aren’t any turns — just like the real thing. Play your punches on your opponent’s head and body, and block punches thrown at you. Win 3 rounds based on judge points, or get a knockout to win. It’s a really cool simulation of boxing, though obviously without the physical component. But trust me — you can still get pretty worked up. The rules are pretty fun, too: they encourage trash talk and shouting out “Combo!” and “Knockout!” in a condescending voice. All of the cards are the same size, about standard card size. They feel a little thicker and sturdier than most cards, though perhaps also a little more brittle. The thicker cards are important, though, because (as you’ll see) they’ll probably take a good deal of abuse. The Punch cards are distinguished by their borders — one player gets black-bordered cards and the other gets white-bordered cards. 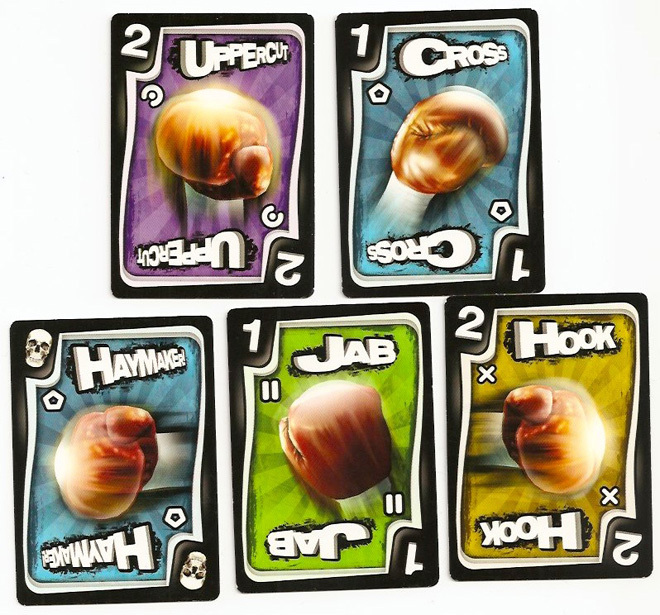 Each card has a boxing glove, the name of the punch, and a point value (or a skull for the Haymaker). There are also five different colors, and each color is associated with a little icon (for color-blind players). For non-color-blind players, you can pretty much ignore the little icons — and I would think that even with the icons a color-blind player may be at a disadvantage considering the speed the game takes. The Ding! 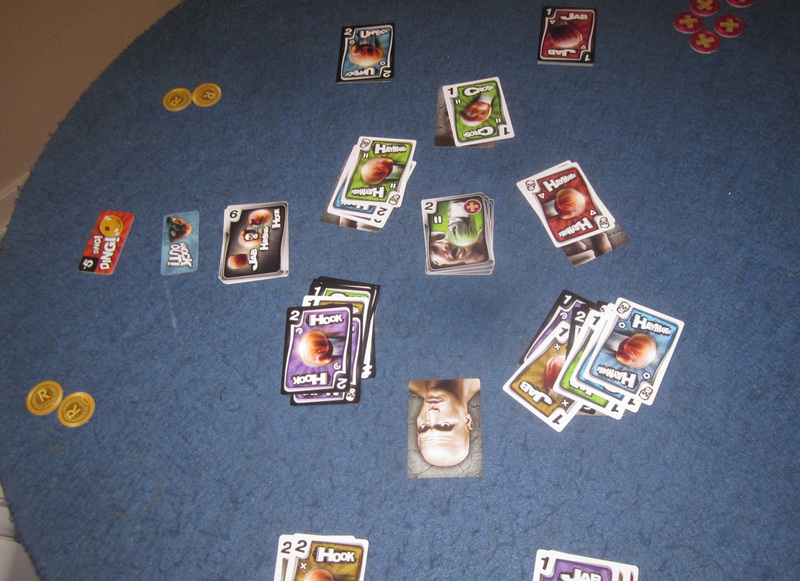 tile, Clinch/Knockout tile, and Health/Round Win tokens are all sturdy cardboard. The artwork is pretty good, though you won’t have much time to stop and admire it in play. A couple things that I think would have been nice: first, the Counter-Punch and Combo cards, which each go into a separate pile and never get shuffled with the player Punch cards, have the same card backs and are pretty similarly bordered. It would have been nice to label these differently on the back for easy separation, and also make the fronts a little easier to distinguish. Likewise, the two player decks never have to be shuffled together, so maybe differently-colored backs would make the sets just that much easier to separate. It’s not a deal-breaker, though, just a slight inconvenience. Also, the game box is fairly large for the size of the game itself. I know, it’s all about the shelf space, but really: the game is a deck of cards and some tokens, all of which could fit in a large pocket (except for the rulebook). The box for it is about the size of a hefty hardcover book — and is mostly empty. It’s a personal pet peeve, but I may end up making my own box to save on shelf space. You can download the rulebook here as a PDF, but I’ll give you a quick rundown. The object of the game is to either knock out a player (by reducing them to zero health points and then damaging them while they’re in danger) or to win three rounds based on judge points. To block punches that your opponent throws at you, you play cards on yourself — they have to match either the type of Punch or the color. However, any Punch card can be used to block a Haymaker. 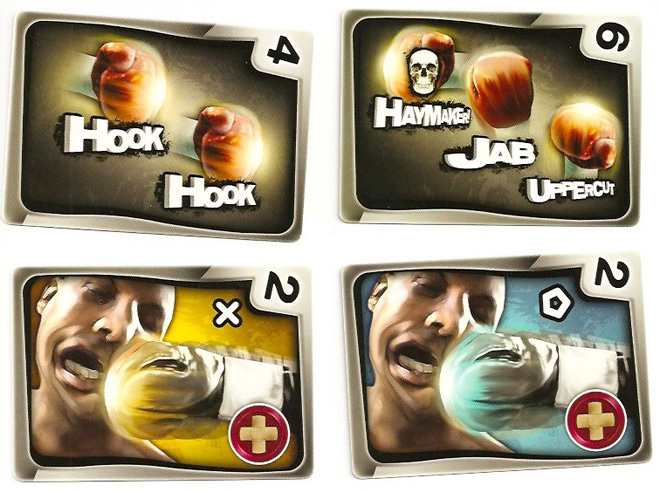 If at any point the punches shown on the topmost Combo card match the cards on your opponent’s boxer (in any order), then you can shout “Combo!” and grab the card, putting it by your health points. This can include cards that your opponent played to block. Some Combos have only two punches, and some have three. To perform a Counter-Punch, there needs to be at least one card on your opponent and one card on you that match the color of the topmost Counter-Punch card. If you see this, you cover the matching card on your own boxer (protecting that part of the body), grab the Counter-Punch card from the center, and put it by your health points. Then you also take one health token from your opponent. Note that the game doesn’t stop while you’re doing this. Finally, if you find yourself out of hit points, you can Clinch: you say “Clinch!” and the game is immediately paused. You take the Clinch tile, and then take two health points from your opponent. Then you pound fists and continue the game. You can only Clinch once per round. If nobody is knocked out, the round ends in one of two ways: either when both players have used up all of their Punch cards, or when one player runs out of cards and takes the Ding! tile. The Ding! tile subtracts 5 points, so it’s not a great idea unless your opponent still has a whole lot of cards or you know that you’ve racked up a lot of judge points. 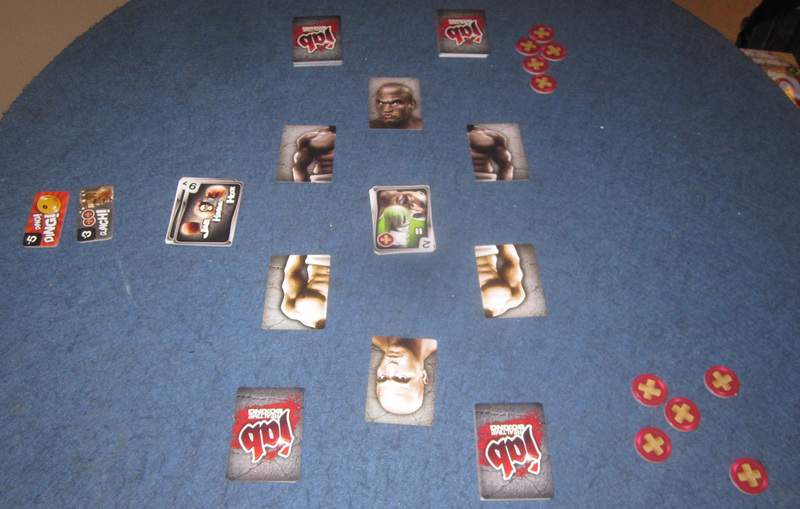 Then everything is set up again for a new round, until somebody wins three rounds or knocks out their opponent. I love playing games that have different mechanics. There are genres that I enjoy more than others (currently I’m on a deck-building kick) but in most cases they share the bulk of the mechanics with some slight variations. Then there are games like Jab (or Catacombs , for instance), which have gameplay that is unlike almost any other game, and it’s such a refreshing change of pace. There are a couple of things that make Jab particularly challenging. First, since you are playing with both hands, and you’re limited to “punching” only with those two hands, there are a lot of cards flying back and forth. This is particularly true because you’re reaching across your opponent to hit at their boxer, while they’re punching at you. When you block, it feels like pulling back because you’re playing cards close to yourself. When you both reach out at the same time in the same direction, there can be collisions (which is where the cards can get damaged). Also, as we played, you could see different styles of play. Sometimes you hold back, waiting to see what your opponent does, and trying to line up a combo for more points. On the other hand, if you pummel your opponent with a flurry of punches, they have to respond quickly or risk losing health. It’s a lot of different things to track while the game is flying by: watching for Combos and Counter-Punch opportunities, trying to punch and block at the same time. On top of it all, I really love the way the end-of-round scoring works. Since you get to take one pile out of the equation, and the opponent has to choose between the other two, they have to spread out the punches. Simply piling on the damage in one spot, while it reduces the chances of getting blocked, means that you’ll score no points at all because your opponent will cover that one up. But it’s also really hard to remember which area had the most punches and fewest blocks, resulting in the optimal score. But the best thing I can say about Jab is that it’s fun. If you start playing this game, you’ll get a spike of adrenaline as you’re trying to strategize quickly, and it can all be over in a flash. Chances are you’ll play more than once at a time. For twenty bucks, that’s a pretty good deal. You can purchase it at your friendly neighborhood game store, directly from Tasty Minstrel Games, or Amazon and other online retailers. Wired: Fast-paced boxing will get your blood pumping. Very well-designed scoring system. Tired: Bigger box than necessary. You might want to get an extra copy for when your first is demolished.